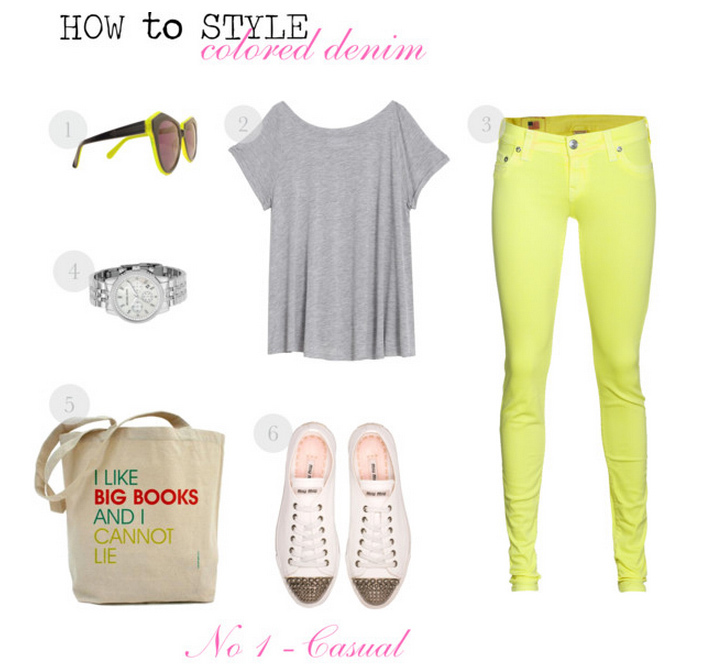 Happy colored jeans is one of the main obsessions of the fashion world at the moment. Striking neon, cream or delicate pastel… the choice is endless. To style it also easier than one can imagine. The main idea is to keep it simple to let the color play the leading role. So here are the two examples. 1. For a casual look (above) pair your happy pair of jeans with a simple T in summer or with an over-sized knit (like this one) in winter. When choosing a top, go for light neutral colors like grey, beige or off white to accentuate the brightness of your bottom (i.e. jeans). Add your favorite pair of sneakers, a watch, linen tote and you’re set. 2. 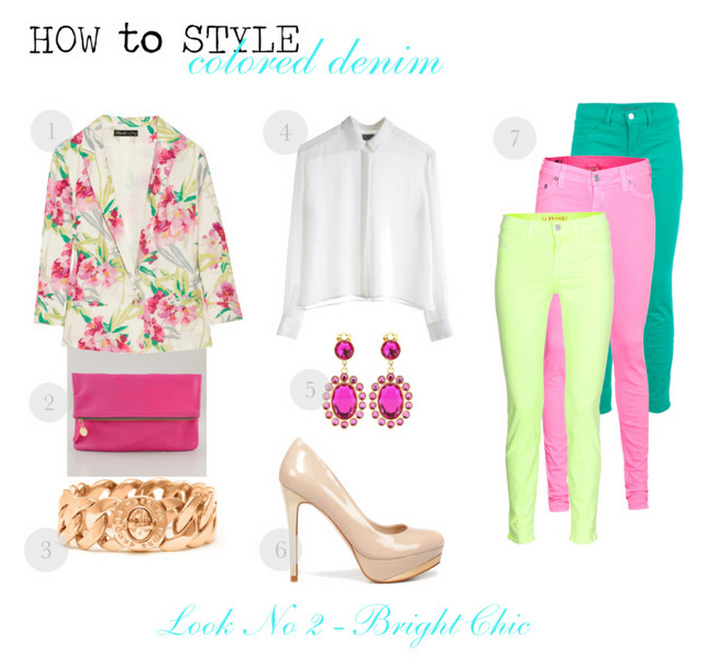 For a dressier occasion, pair the jeans with a button up blouse and a tailored blazer. I love floral, therefore my choice for the blazer, yet a plain white or beige one would also be a great match. When accessorising, go for gold/silver chunky chains or colored crystals in tone with your jeans and make sure to add a bag as bright as you feel comfortable with. Ta dam!! The ensemble as seen on the streets of Paris during the fashion week is born. So darlings, what do you think about this? Have you already obtained your perfect pair of happy jeans? Hey Maria, loving both of these looks, esp the first (though the pink J Brands are to die for!). I’m totally loving the coloured skinnies & really want a pair in pink (Gap) & lavender (River Island)… in all honesty I’m just not sure if I’m too old to wear them, though I don’t consider myself a typical 42 yo. I’d really appreciate your honest opinion as I don’t want to look like an idiot! Ahh I love those Miu Miu sneakers! Too cute. I love the first look, I don’t think I could pull of the second one. Omg love these outfits! I’m so inspired to shake up my wardrobe with some pretty pastels! So pretty! I scrolled down to see who the books tote was by and it’s ‘unknown’. Curses! I need it in my life. I wear my bright jeans (green, aqua and royal blue pairs) in a similar way – loose, neautrl top (normally grey) and a statement necklace or bag. You have a such a great eye for style! I’m really loving the ‘I like big books and I cannot lie’ tote. So fun and quirky.